This is the follow up of my previous post about building a custom Eclipse distribution. In this post I’ll show how to deploy the p2 site and the zipped products on Sourceforge. Concerning the p2 site, I’ll use the same technique, with some modifications, for building a composite update site and deploy it with rsync that I showed on another post. The code of the example can be found at: https://github.com/LorenzoBettini/customeclipse-example. In particular, I’ll start from where I left in the previous post. The source code assumes a specific remote directory on Sourceforge, that is part of one of my Sourceforge projects, and it is writable only with my username and password. If you want to test this example, you can simply modify the property remote.dir in the parent pom specifying a local path in your computer (or by passing a value to the maven command with the syntax -Dremote.dir=<localpath>). Indeed, rsync can also synchronize two local directories. Recall that when you perform a synchronization, specifying the wrong local directory might lead to a complete deletion of that directory. Moreover, source and destinations URLs in rsync have a different semantics depending on whether they terminate with a slash or not, so make sure you understand them if you need to customize this ant file or to pass special URLs. 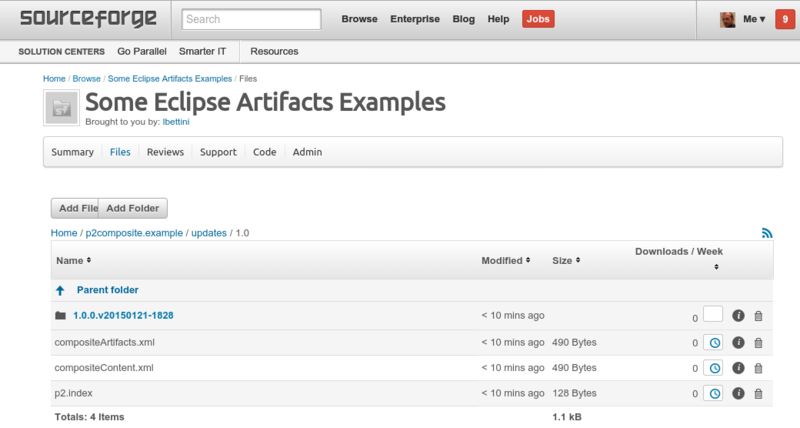 customeclipse.example.ide.site: This is the update site with our features and bundles and the Eclipse product definition. To reuse the ant files for managing the p2 composite update site and syncing it with rsync, and the Maven executions that use such ant files, we put the ant files in the parent project customeclipse.example.tycho, and we configure the Maven executions in the pluginManagement section of the parent pom. The pluginManagement section contains the configuration for managing the composite update site. ATTENTION: in the following snipped, for the sake of readability, I split the <appArgLine> into several lines, but in your pom.xml it must be exactly in one (long) line. The pluginManagement section also contains the configuration for updating and committing the composite update site to Sourceforge. Now, we can simply activate such plugins in the build sections of our site projects described above. In customeclipse.example.ide.site we have similar sections, but the profiles are called differently, release-ide-composite and deploy-ide-composite, respectively. NOTE: The remote directory on Sourceforge hosting the composite update site will always be the same. This means that the local composite update site created and updated by both deploy-composite and deploy-ide-composite will be synchronized with the same remote folder. 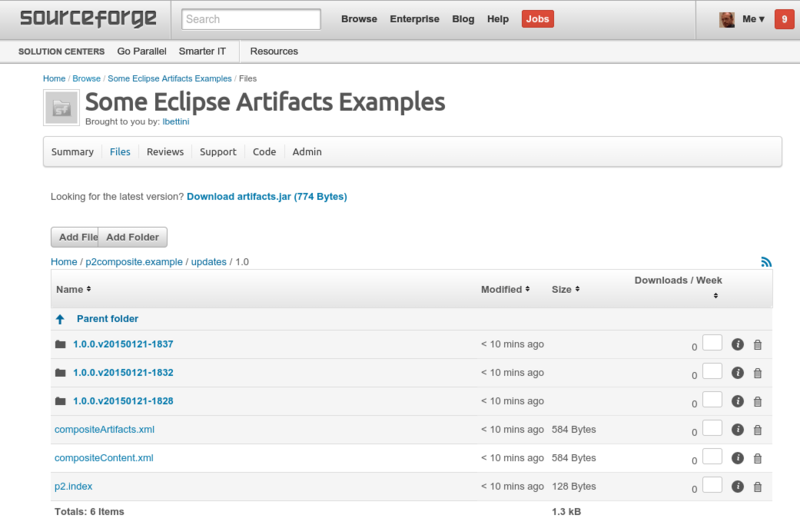 In the customeclipse.example.ide.site, we added a p2.inf file with touchpoint instructions to add as update site in our Eclipse products the update site hosted on Sourceforge: http://sourceforge.net/projects/eclipseexamples/files/customeclipse/updates. To copy the zipped products on Sourceforge we will still use rsync; actually, we won’t use any synchronization features: we only want to copy the zip files. I could have used the Ant Scp or Sftp tasks, but I experienced many problems with such tasks, so let’s use rsync also for that. The ant file for rsync is slightly different with respect to the one shown in the previous post, since it has been refactored to pass the rsync macro more parameters. We still have the targets for update/commit synchronization; we added another target that will be used to simply copy something (i.e., the zipped products) to the remote directory, without any real synchronization. You may want to have a look at rsync documentation to fully understand the command line arguments. Note that when calling the rsync-copy-dir-contents of the rsync.ant file, we pass the properties as nested elements, in order to override their values (such properties’ value are already defined in the parent’s pom, and for this run we need to pass different values). 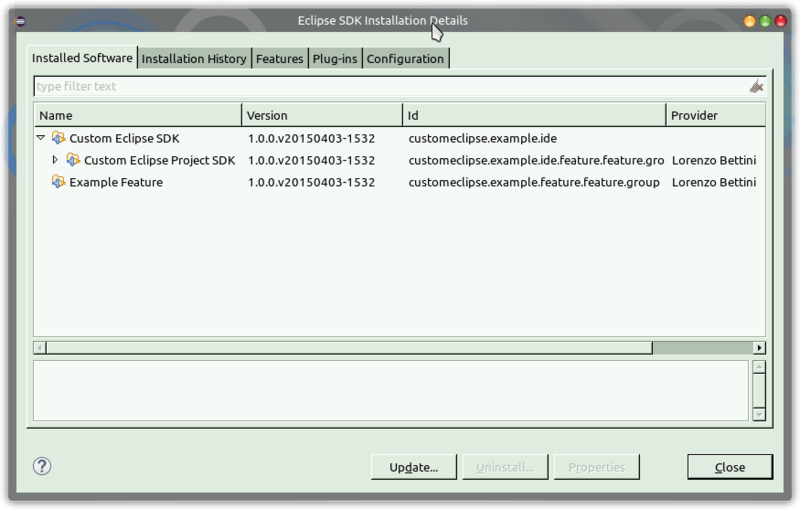 Recall from the previous post that since in customeclipse.example.ide.feature we added Eclipse features (such as the platform and jdt) as dependencies (and not as included features), then the p2 update site we’ll create will not contain such features: it will contain only our own features and bundles. And that was actually intentional. However, this means that the users of our features and of our custom Eclipse will still need to add the standard Eclipse update site before installing our features or updating the installed custom Eclipse. If you want your p2 repository to be self-contained, i.e., to include also the external dependencies, you can do so by setting includeAllDependencies to true in the configuration of the tycho-p2-repository-plugin. However, doing so every time we add a new p2 update site to the composite update site would make our composite update site grow really fast in size. A single p2 repository for this example, including all dependencies is about 110Mb. A composite update site with just two p2 repositories would be 220Mb, and so on. The ant file will use the p2 director command line application to install our Eclipse product directly from the remote update site (the ant file is self-contained since if the director application is not already installed, it will install it as the first task). 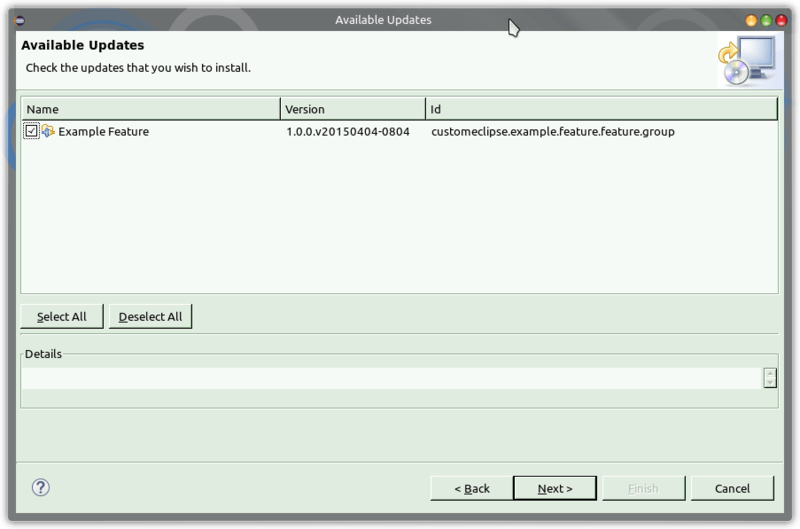 Note that this will always install the latest version present in the remote composite update site. For instance, consider that you created zipped products for version 1.0.0, then you deployed a small upgrade only for your features, version 1.0.1, i.e., without releasing new zipped products. 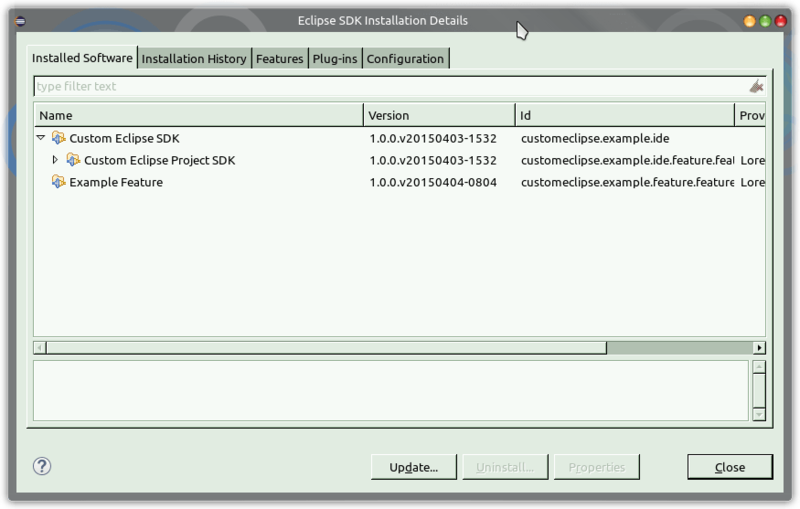 The ant script will install the custom Eclipse including version 1.0.1 of your features. After I deployed the self-contained p2 repository and the zipped products (activating the profiles release-ide-composite and deploy-ide-composite, with the property includeAllDependencies set to true, using the project customeclipse.example.ide.site), I deployed another p2 repository into the composite site only for the customeclipse.example.feature (activating the profiles release-composite and deploy-composite, i.e., using the project customeclipse.example.site). 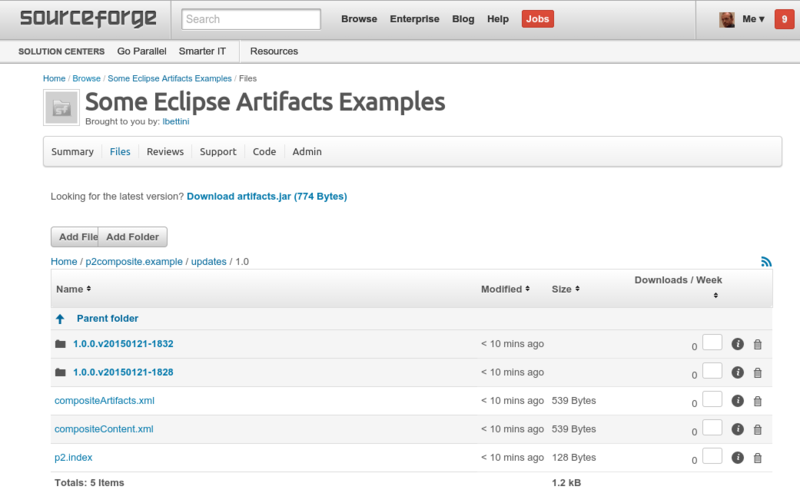 Now, try to install the product using the ant file shown above, that can be downloaded from https://raw.githubusercontent.com/LorenzoBettini/customeclipse-example/master/customeclipse.example.tycho/install.ant. You’ll have to wait a few minutes (and don’t worry about cookie warnings); run this version of the custom Eclipse, and you’ll find no available updates: check the installation details and you’ll see you already have the latest version of the Example Feature. This entry was posted in Tutorials and tagged eclipse, p2, rsync, sourceforge, tycho on April 4, 2015 by Lorenzo Bettini.